This one was suggested by my friend and colleague Joni Klippert, and has the merit of consisting of ingredients I already have. That is, except for the Luxardo cherries, which I was long overdue to procure. Shake or stir. The original recipe says use a coupe glass, but because it’s a Manhattan derivative I think it should go in a cocktail glass. Turns out I wasn’t paying attention and used the wrong side of the jigger, so I made a double recipe. That worked out ok. This is a delicious cocktail and it’s not as strong as a Manhattan. From F&W Magazine directly to your home bar! I can’t wait to try it… sounds absolutely delightful! Not thrilled with this drink. Very sweet and rich. 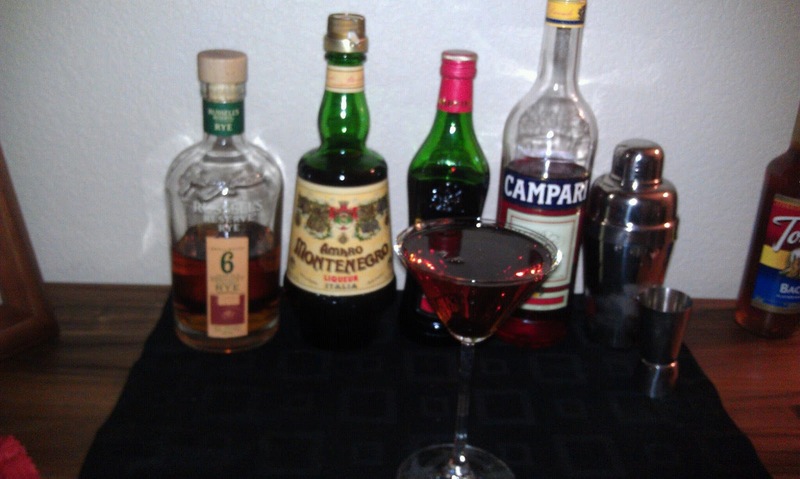 Perhaps with about double the rye or a bit more Campari, a distinctive taste might come through. This might be good as a digestif to finish off a heavy meal. I’ll play around with the recipe a bit to see if I like it better in different proportions.